This tutorial creates an Xcode project which you build in Xcode 4 (or from the terminal using xcodebuild). This is for two reasons: I kept running into issues using make (which I will detail below) and because many may prefer to have an Xcode project available to them so that they can work directly with the code base in a modern IDE setting. There is a tutorial on the ZDoom wiki on how to compile ZDoom on OS X and while it is a good jumping off point, it was not perfect and I needed to tweak a couple of things to get everything working. 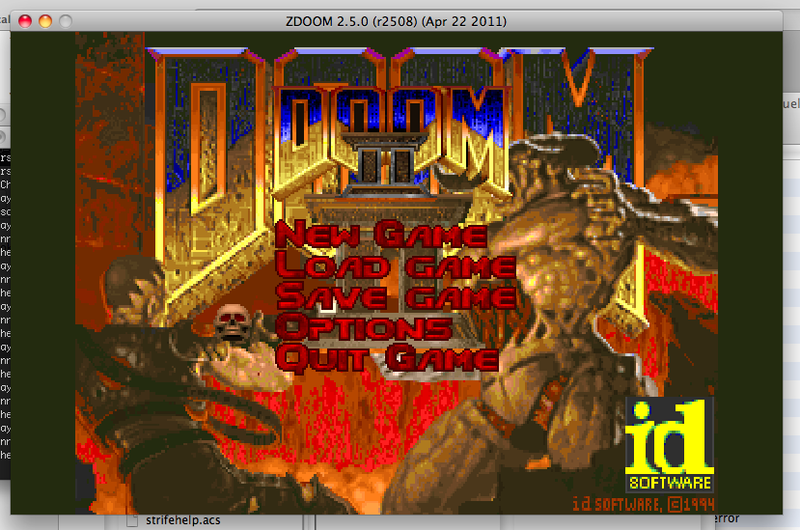 This tutorial focuses on building the latest stable release of ZDoom as of this writing, which is 2.5.0. 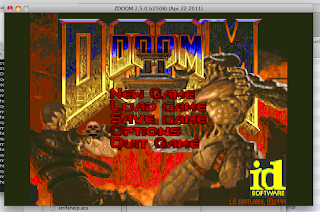 Download the ZDoom 2.5.0 source code (in 7-Zip format). You will also need FMOD Ex 4.26.36 . This is not the latest release. ZDoom is not updated to work with newer versions of FMOD unless necessary due to the fact that downloading FMOD is annoyance and a hassle. ZDoom is also not bundled with FMOD, I believe due to the licensing reasons. FMOD is the biggest hassle in the entire build process. If you are curious, FMOD is the sound engine library. If you do not have this version of it (not a newer one, but this one specifically) you will not be able to build ZDoom. You will also need CMake (make sure this is updated but no specific version except "latest" or 2.4+ is required). You can install this through MacPorts as well, if you prefer. Just type sudo port install cmake in the terminal. Finally, make sure you have SDL installed (the latest, 1.2.14 is recommend on the ZDoom wiki). SDL is a library used for low level access across platforms. According to the ZDoom wiki, you will want to extract the source into a folder of your choosing such as /path/to/file/ZDoom/ and then work from the terminal in the ZDoom directory. 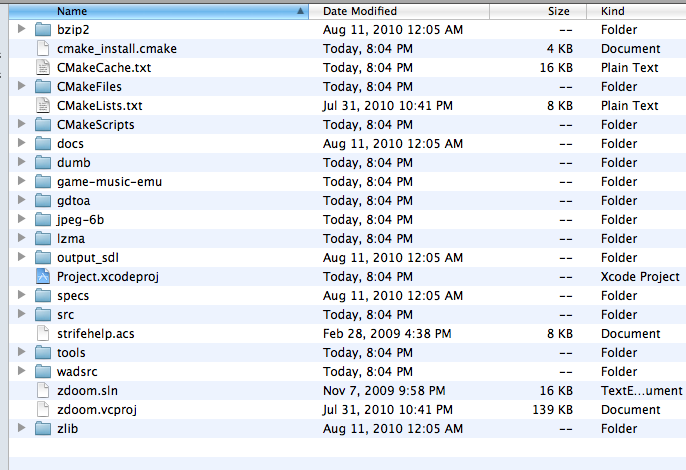 Once you are in this directory, you are to run cmake such that the entire make is prepared for you. You are told to invoke the following. Do not invoke the following but read on in my blog. Now this isn't too far away from what needs to be done. Note that /Developer/FMOD Programmers API Mac/ is the default install location of FMOD, but make sure this is pointing to the correct directory, especially if you are maintaining various versions of FMOD in various directories (one for ZDoom at 4.26.36 and the latest stable one for other projects, for example). If you haven't changed anything and just installed FMOD as is, then the above should be fine. When I ran this, CMake worked properly. I followed up by running make in the ZDoom directory and I even hit 100% in the building process. However, when it began to link, everything fell apart. The ... is just a ton of errors and warnings relating to FMOD from the code and has been omitted due to irrelevance. What this error is stating is, simply put, that FMOD Ex's dynamic library, libfmodex.dylib was not found to be 64 bit compatible. The universal binary only has entries for i386 and ppc. It has no x86_64 architecture. This isn't a problem; this version of FMOD isn't supposed to have a 64 bit version for OS X. 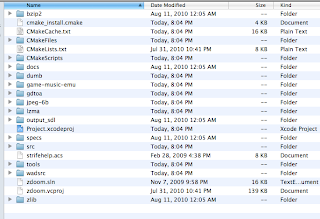 Even now, I believe the only OS X 64 bit support FMOD has is in development releases. However, non OS X releases have 64 bit modes and ZDoom can be built in 64 bit mode. Therefore, I realized that ZDoom must be attempting to build in 64 bit mode but cannot link to a 32 bit dynamic library that has no 64 bit architecture. The issue here was to get ZDoom to build in 32 bit mode. To force 32 bit mode, I decided to start from scratch and redo my CMake command as such. Do not execute this either, this is still my list of failed attempts. As you can see, the only difference here is that I have added the line -DCMAKE_OSX_ARCHITECTURES=i386 which tells CMake I want to use a 32 bit Intel architecture. For PPC 32 bit, you would use ppc instead of i386. Now this seemed like a fine solution; since my original attempt had failed to link due to the entire codebase being built in 64 bit and attempting to link to a 32 bit library's nonexistent 64 bit architecture, I only needed to force a build in 32 bit mode and that line should do it. Unfortunately, this did not work either. Although cmake was able to properly work, running a subsequent make did not even complete building. /var/folders/0M/0Mqx0BzgE9SauLHWfk8q7k+++TI/-Tmp-//ccurbRiw.s:501:non-relocatable subtraction expression, "LC0" minus "L00000000009$pb"
For some reason, a_armor.o could not be built, due to an error that seemed to be related to bittiness (the code was not compiling now due to a forced 32 bit compile). Instead of sorting out Makefiles and CMake files and all of that, I decided to use CMake to build an Xcode project and work from there, because command line cmake and make were not cutting it. We are in luck because CMake has built in support for Xcode. Of course, the project generated will need some tweaking (nothing is ever easy, is it) but this will finally yield a buildable project with the added bonus of being in the OS X development environment of Xcode (for ease of playing around). First, cd to a fresh directory of the ZDoom source code in the terminal. Then we will run cmake again. You may notice that this is almost the same as above, except that the first line now includes -G Xcode. This is a command used by CMake to build an Xcode project file (.xcodeproj). Once again, make sure that the FMOD API is the correct version (4.26.36). 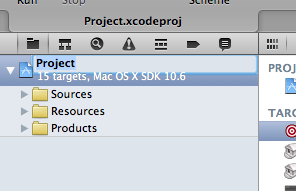 You should see a file, Project.xcodeproj. This is the project file. Open it up in Xcode. You will see that the name of the project is "Project" which is a terrible name. Slowly double click on the project title in the upper left corner to edit the name. Change it to "ZDoom" because that is what it is. Click through all the renaming confirmation boxes and your project file and project's internal name will be refactored to "ZDoom". Note: Throughout this tutorial I am going to describe builds that I know will fail, to explain what you must fix in the project. Feel free to trust me and just skip the building, failing and cleaning and simply change what I tell you until we get to the final build which should work. 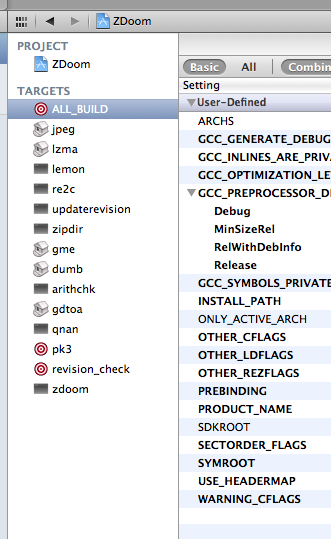 Also, I am working in the ZDoom-Xcode directory. I am going to build this now, despite not having made any significant changes. I am building the ALL_BUILD target in 32 bit mode (which is what we will be building every time). Our build expectedly fails, due to some of the scripts attempting to access certain compiled targets such as arithchk and updaterevision. These are both executable files built during the ALL_BUILD build. However, the scripts that are looking for these executables are looking in the wrong place for them and failing. The executables are properly built but the scripts are looking for them in main directory of the .c files. The executables are actually getting built to a folder named after the current configuration. Since I am building in Debug mode in Xcode, the executables are in directories entitled Debug. updaterevision is located at /ZDoom-Xcode/tools/updaterevision/Debug/updaterevision but is being looked for at /ZDoom-Xcode/tools/updaterevision/updaterevision where updaterevision.c is located. 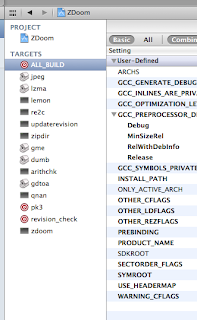 Likewise, arithchk is located at /ZDoom-Xcode/gdtoa/Debug/arithchk but being looked for at /ZDoom-Xcode/gdtoa/arithchk. The work around for the problem that I have come up with involves symbolic links. Configuration directories such as Debug and Release are desirable and the configurations are actually the result of our CMake. For some reason, however, certain scripts don't know to use configuration directories. Instead of messing with generated scripts or searching for the problem on that level, we will simply create symbolic links to the executables after they have been built so that they exist in the configuration directory but can be accessed from the parent directory. First, click on the ZDoom project so that you see this. We are going to start with arithchk, but the principle remains the same throughout. First, choose arithchk from the sidebar. Then, click on "Build Phases". At the lower right corner, you will see and "Add Build Phase" button. 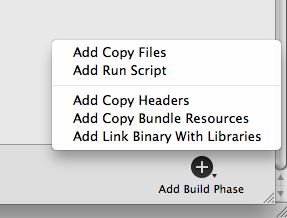 Click on it and choose "Add Run Script". $CONFIGURATION is a helpful variable that will simply be "Debug" or "Release" or whatever other configuration name is being used. This will match the folder that the executable exists in. Make sure you use an absolute path to your ZDoom-Xcode directory. $SRCROOT represents /absolute/path/to/workspace/ZDoom-Xcode (see update note for 5/8/2011). Make sure to wrap this in quotes since the path may include spaces. We use -f in order to force overwriting of any links that may already exist (otherwise, rebuilds would fail). Now, the project should build without error! To actually run zdoom, cd into the Debug folder (or whatever folder mirrors your configuration for building) in your main ZDoom-Xcode directory, and run ./zdoom. First, however, you must have copied a few files into this directory. 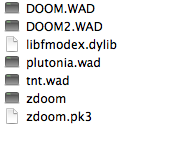 You must have at least one IWAD file (a .wad file from either shareware Doom , Doom , Ultimate Doom , Doom II , or one of the Final Dooms or any of the IWADs listed on the ZDoom Wiki), the zdoom.pk3 file from the main ZDoom-Xcode directory, and a copy of libfmodex.dylib from your FMOD install (by default located at /Developer/FMOD Programmers API Mac/api/lib/libfmodex.dylib). Now you can build ZDoom from Xcode, and even work on it in the Xcode environment if you so choose. Enjoy! Vanilla Doom is my favorite flavor ;_; With chocolate sauce. Yum. I just wanted to let you know I was able to successfully follow your instructions using Xcode 3.2.4 instead of 4. For the symlinks you don't need to use an absolute path.